Here is a study where the authors looked at THOUSANDS of spinal images to determine if a change in the spinal shape leads to pain, dysfunction, and a change in the quality of life. 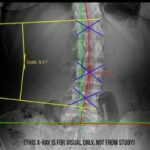 Many providers feel a change of the spinal shape may be "normal" for a person and therefore treatment to address these changes is not necessary. Well, this paper clearly shows that is false. Not only that, but the chiropractic profession also has many providers saying "x-rays or imaging is NOT necessary". Well, again, according to this paper, and many studies on this . . .